The Hub’s Grand Opening event was recently featured in an article by the Register-Herald! Click here to read the full article. Grow Appalachia: Salsa for all! by Emily Barrineau Though tomato vines have long been frozen and cleared away and we are only beginning to lay the groundwork for many more bushels in 2016, here at High Rocks we are still in the midst of canning season! I have been working on a salsa fundraiser project, with an entire chest freezer full of tomatos and peppers waiting to be canned. Our goal is to make salsa that we can sell to the public, serve at our youth centers, and feature on the menu for our new food trailer. We have jumped through many hoops, and still have a few to go. The first thing we had to do was find a recipe. We started with one from the Ball® canning cookbook. 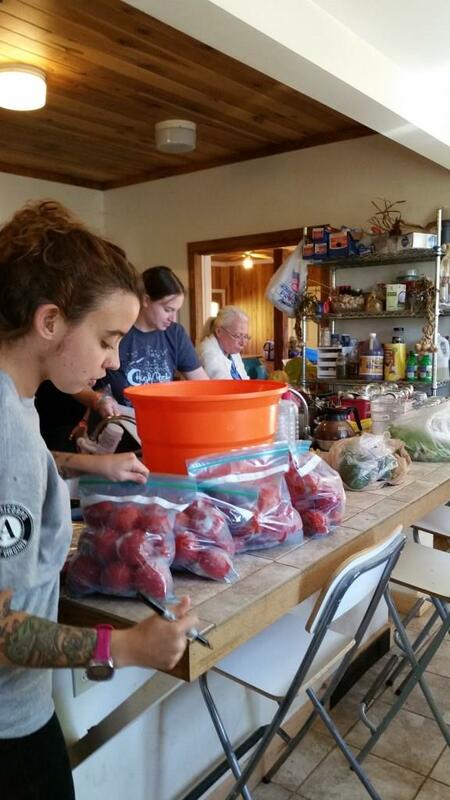 Our first round of salsa making was with a group of college students from Haverford College and some Grow Appalachia participants. We spent about six hours making about 30 cans of salsa. The salsa was good but there wasn’t anything that made it stand out. So my next task was to improve the salsa recipe. I read that you could change the amount of hot peppers as long as you replaced the amount with another type of pepper. I also decided to replace half of the yellow onion with red onion. The salsa needed more spices so I added more garlic, oregano, and ground cumin. Both the red onions and oregano came from the High Rocks garden. Another problem with the salsa was the consistency. We were working with frozen tomatoes and it made it too watery. I defrosted the tomatoes the night before so that I could pour off the extra liquid. 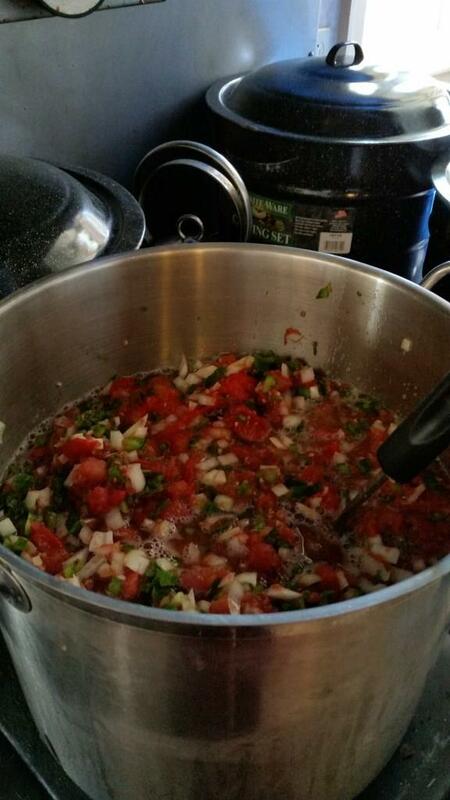 The next batch of salsa was made with a group of girls at the penguin overnight. I taught them about the process for canning food. They did a great job chopping up the ingredients and with helping in the canning process. They were excited about learning that you could preserve the food that you grow in your garden. Now that I found the recipe that we are going to use I need to see if I can recreate the salsa and can it so that we can send it into the WVU extension office so that they can test it. After they test it, we can move on to the other steps on getting our kitchen certified. I hope everyone has a wonderful holiday with families or friends! The college search can be an incredibly difficult process for today’s high school students, with thousands of colleges and universities to choose from in the United States alone. The stress of this decision often begins much earlier than senior year as students attempt to navigate the options available to them. Although resources exist to aid in this process, the final decision is a very personal one. For this reason, it is often helpful to visit a variety of colleges and universities to gain a better sense of what college is like. High Rocks Academy for Girls hopes to assist students in the college search and application process by providing free college trips to girls in the 7th-12th grades. Trips are available throughout the school year. This fall, High Rocks girls have already traveled to seven colleges and universities in four different states. These include West Virginia University, Chatham University, Carnegie Mellon University, Roanoke College, Virginia Polytechnic Institute, the University of North Carolina at Chapel Hill, and Duke University. Students who attend college trips with High Rocks have the opportunity to meet with an admissions counselor, attend an information session led by the office of admissions, and take a tour of campus with a current student. This allows them to ask any questions they might have, as well as learning more about academics and campus life. Additionally, if High Rocks alumnae currently attend any of the colleges or universities on the trip, participants have the chance to meet with them to learn about their experiences and ask questions. by Emily Barrineau Winter is coming! This is my least favorite time of the year because of the bitter weather and the less time I will get to spend outside. The days are getting shorter which means there is less sunlight that the plants can turn into energy. Winter also means less fresh produce from the garden unless you have a way to keep the plants warmer and product them from the elements. 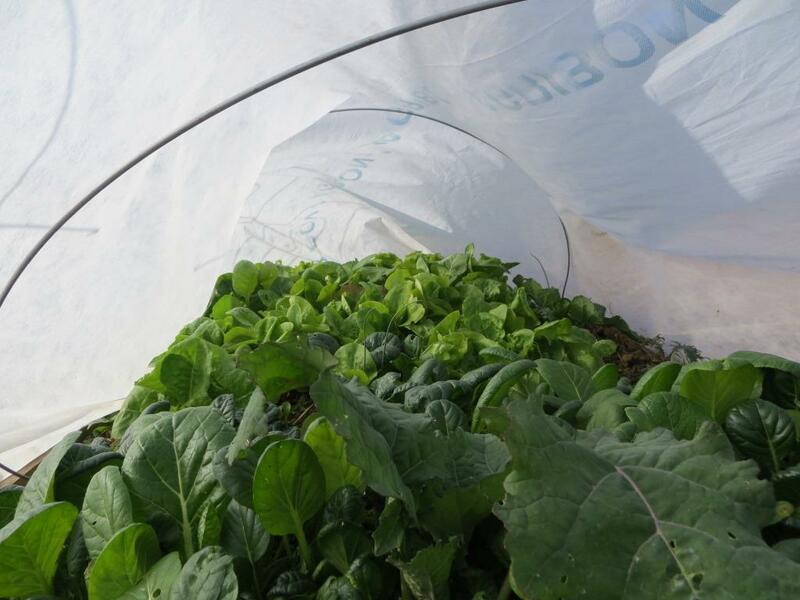 Not everyone has space or resources for a high tunnel but there are some other ways that you can still have some fresh veggies throughout the winter. If you already have some winter hardy plants you want to protect from the cold weather you can extend their season by making a low tunnel out of wire and a row cover. You may use PVC pipe for an alternative to wire to construct the hoops of the tunnel. For the cover, you can use plastic or a floating row cover. Plastic can protect against lower temperatures and snow, but you will have to let some ventilation in on sunny days so it doesn’t get too hot. The floating row cover does a good job at letting sunlight in but does not protect against the elements as well as the plastic when there are below freezing temperatures. To build the low tunnel you want to place a wire hoop every 4 feet. To make the hoops, you want to cut the wire 6 ½ feet long and make a 1 inch diameter loop about a foot from the end on each side. When you cut your row cover you want to make sure that you leave a few feet or more at the end so that you can secure the cover by tying a rope at the end and tying that to a stake or stick to put in the ground. To secure the sides of the cover you can bury the edges or use rocks or sandbags. 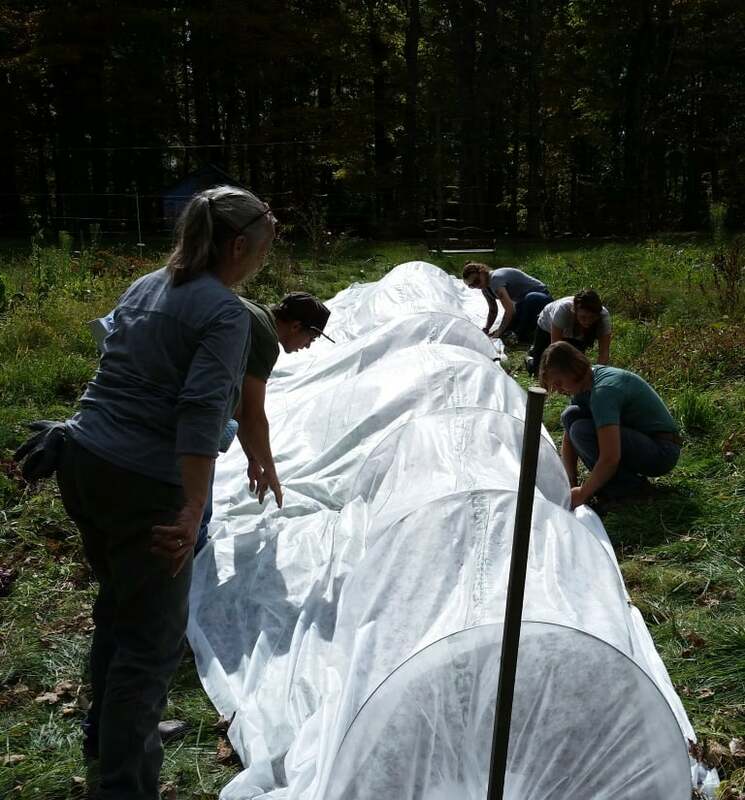 At our season extension workshops we taught the participants how to use wire and floating row cover to protect their crops and we also taught them about overwintering crops. Overwintering is great if you want to get a head start on the next season. To do this, you want to sow your seeds into the garden and protect them with the low tunnel. When you overwinter crops they begin to grow but stop because the days get too short, but when the days get longer they begin growing again. By overwintering you are able to harvest some veggies a month earlier than normal. Just make sure that when you are harvesting your crops that you do this when the temperatures are above freezing. Another way to extend your season and/or overwinter is to use a cold frame. A cold frame is a bottomless box that sits on the soil. There is a cover that goes over the box that can be made out of glass plastic and the sides are usually made from wood. You can buy a cold frame or you can get creative and make it yourself. The internet provides lots of ideas for building, such as using recycled windows as the cover and having the sides be made out of straw bales. Even when the days are getting shorter, I hope you can make your winter a little brighter with some fresh veggies! High Rocks participant elected to Making Caring Common Advisory Board! 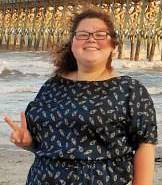 Congratulations to our High Rocks Youth Advisory Board President, Lexie Ruckman! She was nominated and selected to be on the first-ever Youth Advisory Board through Harvard working with Making Caring Common. Your High Rocks family is so proud of you! Young people from all three counties came to Steele Studio in Richwood last weekend for the annual Halloween Overnight where they played games, watched movies and had a costume contest. Check out some pictures of the fun! High Rocks Academy for Girls has been running strong for almost 20 years now, providing camps, tutoring, mentoring, college trips and so much more to educate, empower and inspire young people in West Virginia. These programs change lives and we need your help to make sure these experiences are offered for years to come. This month marks the beginning of the campaign to raise the Legacy Fund that will ensure the next seven years of High Rocks will be as amazing as the last 20 have been. We have a very generous, donor who has agreed to match your donations if we raise $100,000 and we have a matching structure that includes everyone. If you want to learn more about what goes on at camp, watch this really cool video the girls made during one of our camps this summer and then go here to make a donation to the Legacy Fund. by Emily Barrineau Hello! My name is Emily Barrineau and I am the latest Grow Appalachia Americorps Member at High Rocks Educational Corporation. I am originally from Central Illinois but I am excited to be spending the next year in West Virginia! I got interested in gardening when I studied abroad in India in 2013. 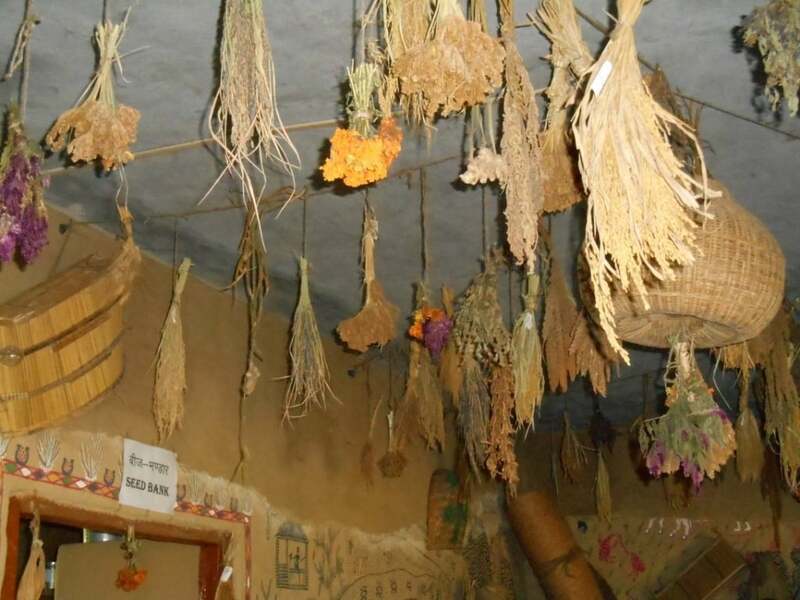 Our group stayed at Navdanya, a biodiversity farm and seed bank located in Derhadun. 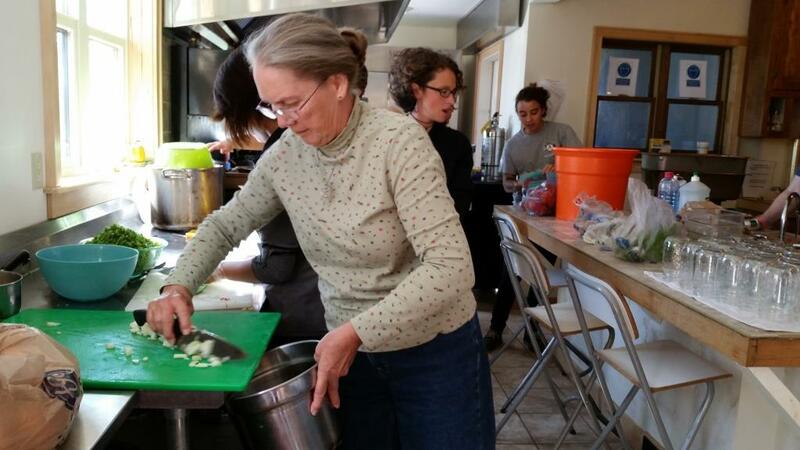 During our stay, we learned how important it is to be less reliant on conventionally grown food because it is healthier for us and Mother Nature too! An awesome way to do that is to grow your own food. After my amazing experience I learned that I wanted to help others find passion in growing their own food and show them how they can do it. And that’s what brings me to West Virginia. I believe that it is important for everyone to have access to fresh and nutritional food. But in some areas in West Virginia families have limited access to this food. One of my goals this year is help families grow their own nutritional food. The first few weeks have been exciting because I have been being able to meet with the Grow Appalachia participants at the workshops. 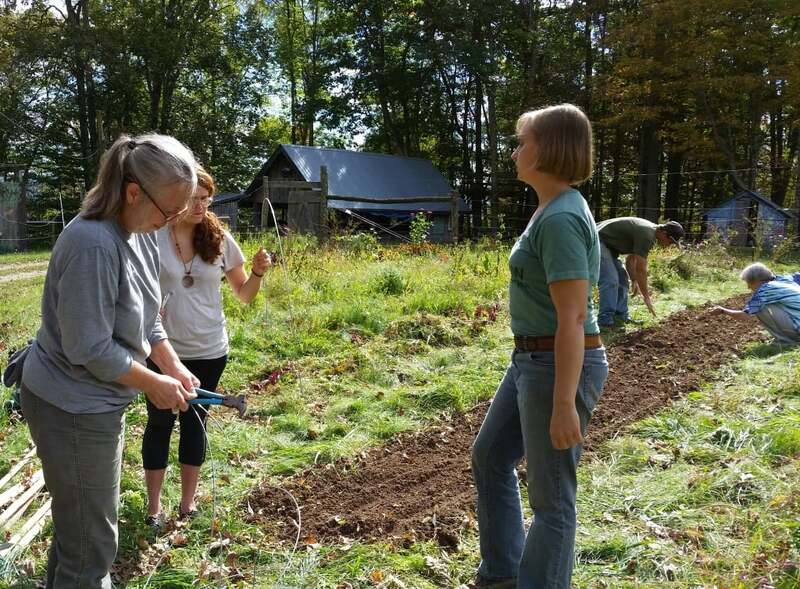 I’ve also been helping another Americorps member get the garden beds ready so that we can plant garlic for High Rocks’ garlic fundraiser that takes place at the Autumn Harvest Festival. We’ve spread out the horse manure onto the beds and tilled them. 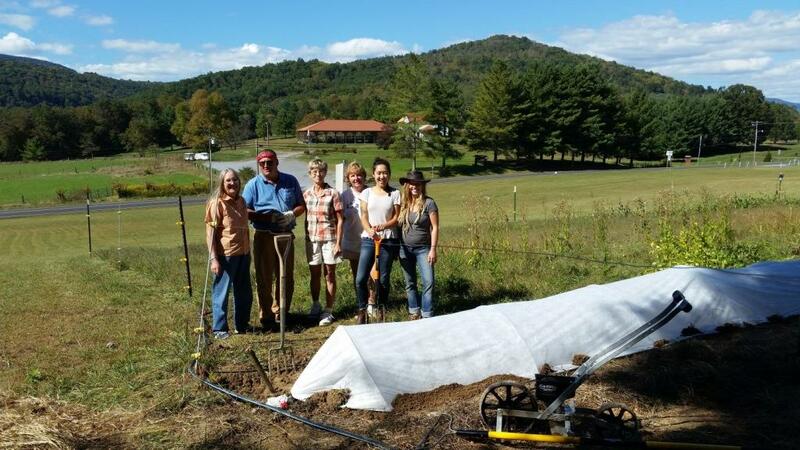 Now we are just waiting for college kids on their fall break to help us plant.I am looking forward to my year with Grow Appalachia and seeing the progress of the family and community gardens! Anger makes people mean, like vicious birds. The cure for bullying can only be found by us! of someone who is trying to help. bully kids, kids bully too. And feel helpless to do anything else. You want to pick on someone who is rude to the insecure. Anger makes people do stupid things, sometimes I watch it. The cure for bullying would be not encouraging it.